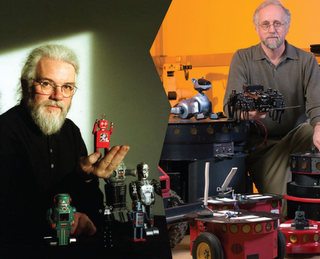 This episode closes a two-part special looking at ethical issues in robotics. Given the broad and controversial nature of this topic, we speak with two world-renowned experts in ethics with often-opposing views. Our first guest featured on our last episode, Noel Sharkey, is Professor of Public Engagement, Artificial Intelligence and Robotics at the University of Sheffield in the UK. In today’s episode we interview Ronald Arkin, the director of the Mobile Robot Lab and Associate Dean of Research at Georgia Tech in the US. Both researchers discuss issues such as military robots, robots in the society, medical robots and legal responsibilities. Their opinions on these subjects have been widely covered by the media, international organizations and academia. The interviews were recorded individually and both researchers were asked the same questions. 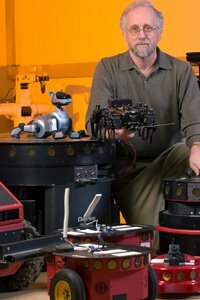 Ronald Arkin is Regents’ Professor and Director of the Mobile Robot Laboratory at the Georgia Institute of Technology where he also serves as the Associate Dean for Research in the College of Computing. By looking at a wide variety of autonomous mobile robots in his lab, either aerial, ground-based or swarming, he’s become a world renowned expert in robotics and control, authoring corner-stone textbooks such as Behavior-Based Robotics – Intelligent Robotics and Autonomous Agents (MIT Press 1998). In the past years, Arkin has become one of the pioneers in robot ethics, tuning in at the start of discussions on Roboethics in 2004. Since then he’s written several publications on the ethics of military robots, arguing that robots in the future could be more ethical than humans on the battlefield. Embedded with a sense of ethics, or even guilt, such robots could perhaps be able to make decisions in life-death situations. His views are presented in his new book to appear in spring 2009 entitled Governing Lethal Behavior in Autonomous Robots. Other than military robots, Arkin discusses issues such as the attachment of people to robots, and more generally, the role of robots as care-givers or workers in the society. He also touches on the subject of medical robots, or prosthetic, capable of enhancing the human being. Finally, with so many questions raised on the ethics of robotics, we look into the entities which will be setting limits on the use of tomorrows robots as well as defining who takes the responsibly of their actions. Could the robots themselves be held responsible in the end? including a video of the Israel’s new Harop UAV, videos of the iLean and the iHop robots and more information on CMU’s new degree program visit the Robots forum!